So I thought I’d run some tests on the betting agency websites to see who is in the best form leading up to the big race. Jump straight to the infographic here if you like. 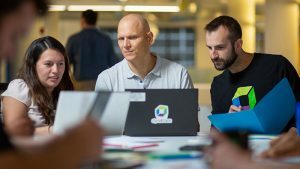 The tests were run using the Dynatrace Synthetic testing network, which is the world’s most comprehensive, tested on their homepages, using the chrome browser every 10 minutes for the past 7 days. 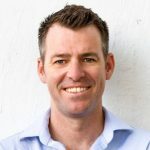 The tests ran from backbone locations in Melbourne and Sydney. 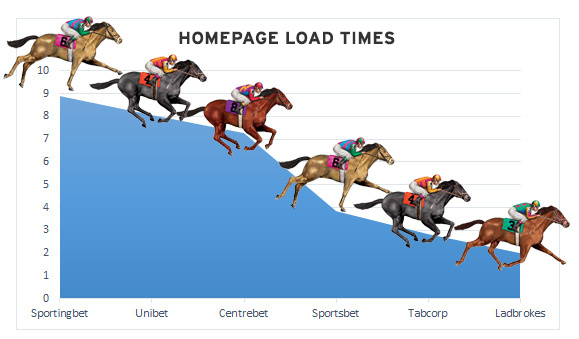 The best performing site in terms of response time is Ladbrokes at 1.97 seconds followed by Tabcorp at 2.8 seconds. The worst performing is Sportingbet which is 8.87 seconds, nearly 6 seconds slower than Ladbrokes. There is a staggering difference between those that appear to have been optimised for speed, and those that have not. Considering 40% of people will bounce from a site if it doesn’t load in 3 seconds, there is going to be some disappointed revenue returns come Tuesday for the bottom 3. I’ll be breaking down why these sites are slow (with some staggering reasons!) later in the post. In our testing period – which is 7 days, only Tabcorp and Sportsbet had 100% availability. Consider the cost of downtime for any of these betting agencies next week when we all race to put a bet on! Millions in lost revenue. So why are some of the sites so much slower? the load times of these third-party hosts (response time of the host). The results suggested that the size of the page contributed to the slow performance of the websites, but what I find interesting was the heaviest site was the fastest – Ladbrokes. The number of third-party hosts did have a considerable effect on the load times. The number of different servers the site has to connect to, to load the page, equates to a longer load time. i.e The more train stops your train makes, the slower the journey. What I find to be the most startling, was the performance of these third-party hosts. Using Dynatrace’s third party analyser I can get a really simple dashboard view that quickly isolates where the sites were having issues. It’s a long diagnosis but there is some really interesting findings, so bear with me. The data below is a view from the past 48 hours. 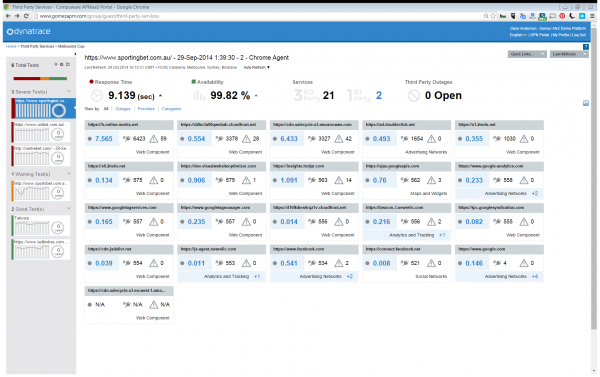 Sportingbet was the slowest performing site. With 21 third-party hosts, it wasn’t the volume of hosts causing the issue, it was the performance of these hosts. In particular is the performance of h.online-metrix.net which appears to be security application. Below you can see a view of all the third-parties. Unibet was one of the poor performing sites. With 37 different third-party hosts, it appears to be a CDN server (llnwd.net) that is contributing the biggest impact on load times. 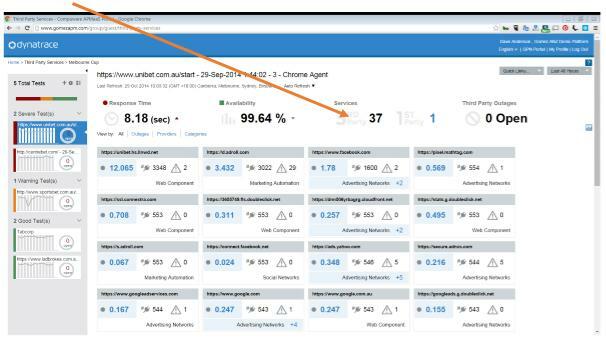 But not only that, Facebook is contributing 1.78 seconds, and Adroll 3.43 seconds. 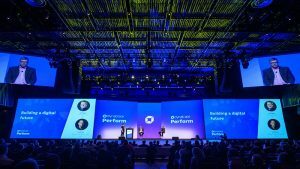 I’d highly recommend losing Facebook and Adroll for next Tuesday! Using the waterfall chart, I could see the biggest contributors of response time which is the processing of high quality images from a CDN. There is also delay in 1st byte time when loading the initial html which suggesting an application backend processing issue. 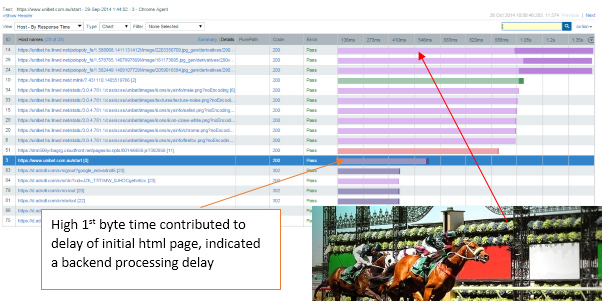 With the second biggest page size and overall load time of 7.64 seconds, it’s not the volume of third-parties (16) impacting the load times with Centrebet, again it’s the performance of these third-parties. Again we see an issue with this h.online-metrix.net object. 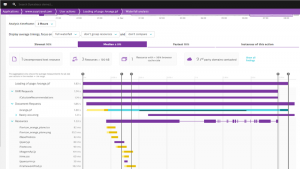 Liveperson, which is a chat software plugin, is causing approximately 3.7 seconds delay, and hotjar, a new form of analytics software is also impacting load times enough to suggest they should be removed. 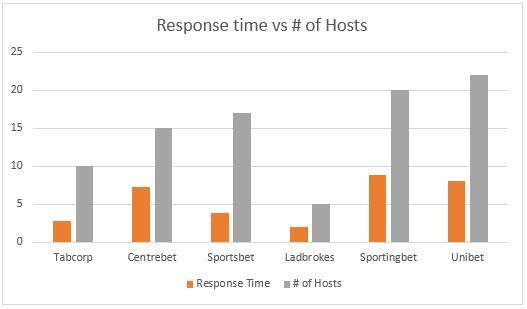 Sportsbet has a load time of 3.5 seconds, and whilst it has 22 third-party services, the performance of each third party during this testing period was satisfactory – with no single host connection above 0.65 seconds. Still it would be worth monitoring their performance in real-time, and switching out anything that causes any form of delay. 22 services – no single service is more than 1 second delay. Tabcorp is the second fastest website with the smallest page size and relatively small number of third-parties (only 10). 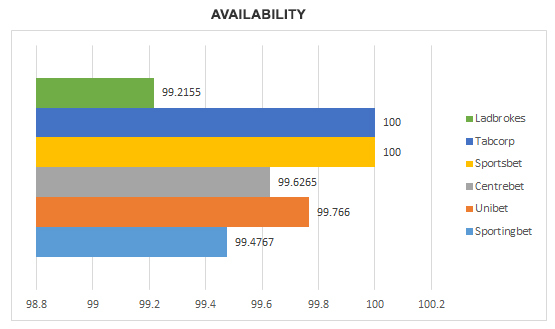 They also performed the best in terms of availability recording 100% uptime in the last 7 days. 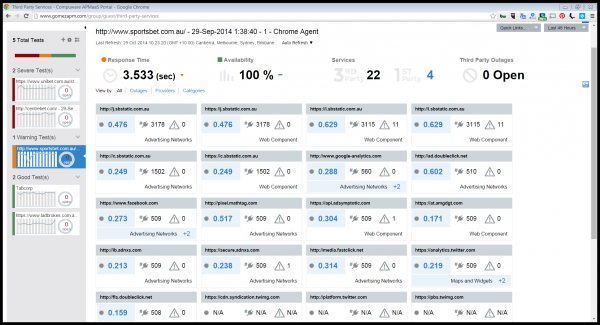 The fastest performing website of this benchmark, interestingly had the biggest page size. Why was it so quick? Only 6 third party hosts! Well it’s the eleventh hour and the horses are almost in the starting gates. It’s not too late for some of these sites to switch out some of this third-parties and re-join the pack. Failure to do so, is likely to see them take a hit in the hip pocket. Good luck.